Home Avoiding Problems What to do if your computer won't start. Is your computer frustrating you? If it is I can help! For upgrades (for example a bigger hard disk or more RAM), repairs, custom builds, virus removal, networking and wireless installation and trouble shooting and more. Reasonable rates and friendly service. Home visits in Caversham, Henley and the Reading area. Give me a call! 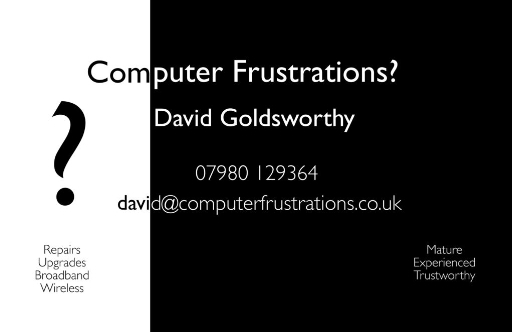 Computer Frustrations is the trading name used by David Goldsworthy for his computer repair business based in Caversham, Reading and covering Reading and the surrounding area. ·	Broadband, installation and trouble-shooting. ·	Anti-virus advice and removal. Computer Frustrations provides first class support with the friendly touch for home users, people working from home and small businesses, whilst avoiding the jargon and remoteness of some of its larger competitors. After more than 25 years working in the electronics industry, latterly as Engineering and Support Manager for Zoom Telephonics (a US based manufacturer of broadband, networking and wireless products), redundancy closed one door, but opened another and David set up Computer Frustrations in 2007. He says he is happier than he has been for years! Although Computer Frustrations has only been formally trading since 2007 David has been building and supporting PCs for friends, neighbours and colleagues for more than 10 years. David has an Honours Degree in Electronic Engineering.